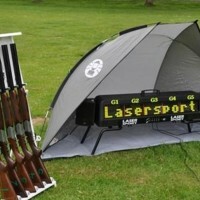 Laser Clay Pigeon Shooting is like a traditional clay pigeon shoot, but with laser beams instead of shotgun cartridges. Each player uses a modified shotgun to fire an infrared beam at real clays launched from a clay launcher. Laser Clay Pigeon Shooting is like a traditional clay pigeon shoot, but with laser beams instead of shotgun cartridges. This activity is one of the most popular participation activities for any kind of group from a Stag Party to a Corporate event. Each player uses a modified shotgun to fire an infrared beam at real clays launched from a clay launcher. Whenever the trigger is pulled, the digital control scoreboard generates the 'bang' and when a player hits the target it reproduces the sound of a breaking clay. There is no risk of hearing damage.